Latest Update (December 7, 2014): Added notes on Yosemite compatibility! USB adapters don't take up an extra PCI slot. Most motherboards have a relatively limited number of PCI slots. You may not want to waste an extra slot on your WiFi adapter if you plan on connecting a lot of PCI devices, such as graphics cards, sound cards, Firewire cards, RAID cards, TV tuner cards, or so on. Micro-ATX motherboards usually only come with 2-3 slots. Mini-ITX motherboards are even worse; most of them only feature a single PCI slot, making a USB WiFi adapter all the more important. USB adapters are slightly cheaper. Most PCI adapters cost $30-40, while USB adapters rarely cost more than $20. Sometimes, you can even find USB adapters on sale for half that price. It's not a big price difference, but it's still something worth considering. A lot more USB adapters work. While Mac OS X only supports an extremely limited number of PCI WiFi adapters, there are literally hundreds of USB WiFi adapters that work with OS X to some degree or another. This means that you might not even have to buy a new adapter for your Hackintosh; if you already own a USB WiFi adapter, there's a decent chance that it'll work in Mac OS X. You have to turn on a utility every time. In addition to installing drivers, in order to get WiFi working correctly with a USB adapter, you will have to turn on a third-party WiFi utility app every time you boot your Hackintosh. Although this is not very hard to do, it can get to be very annoying if you reboot your computer frequently. You have to wait for new drivers. The lack of native support for USB WiFi adapters means that you can't count on your adapter to work between different versions of Mac OS X. Instead, every time Mac OS X gets a big update (e.g. from Mountain Lion to Mavericks), you'll have to wait for WiFi chipset manufacturers to update their drivers appropriately. 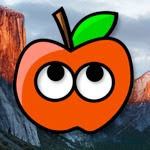 For instance, the chipset manufacturer Ralink didn't release drivers for OS X Mountain Lion until October 2012, four whole months after the official July 25 release of the operating system. Whether a USB WiFi adapter will be compatible with Mac OS X depends on its chipset. You can find the chipset of a USB adapter by searching Google; for example, if you want to find the chipset of the ASUS USB-N13, search "USB-N13 chipset". Usually, the first or second result will be a link to wikidevi.com, which will tell you what "chip" the adapter uses. Most chipsets inside USB WiFi Adapters are manufactured by either Realtek or Ralink. To this day, Realtek still hasn't officially released drivers for OS X Mavericks (10.9) or Yosemite (10.10), the two newest versions of Mac OS X-- however, Realtek's drivers for Lion (10.7) and Mountain Lion (10.8) sometimes work on newer versions of OS X anyways. Meanwhile, Ralink released Mavericks drivers in November 2013, but still hasn't officially released drivers for Yosemite-- however, you may still be able to get WiFi working in Yosemite thanks to a third-party solution. After you've installed the right drivers for your adapter's chipset, a WiFi utility app will be added to the "Applications" folder of your Hackintosh. For adapters with a Realtek chipset, it will be called "Wireless Network Utility.app". For Ralink adapters with official drivers, it will called "WirelessUtility.app". For Ralink adapters with unofficial Yosemite drivers, you will instead have a D-Link preference pane in your System Preferences app called "DWA-140". Every time Mac OS X starts, you will have to launch this app for WiFi to start working. Granted, Mac OS X compatibility isn't a straight shot. Not every USB adapter with a compatible WiFi chipset is actually guaranteed to work with Mac OS X. Some adapters simply don't work at all, for one reason or another. Other adapters work best with drivers provided by the manufacturers of the adapters themselves, rather than with the official drivers from Realtek or Ralink. This section lists USB adapters that have been confirmed to work with Mac OS X 10.6 Snow Leopard, 10.7 Lion, and 10.8 Mountain Lion (unless otherwise specified-- some also work with 10.9 Mavericks and 10.10 Yosemite). This list is incomplete, and never will be complete; it is simply meant as a general buyer's guide. There is also a v3 version of the BELKIN F5D8053 N, which uses either the Ralink RT2770 or RT2720 chipsets-- it has not been confirmed to work with 10.8 Mountain Lion or newer. This adapter will also work on 10.9 Mavericks and 10.10 Yosemite (!) 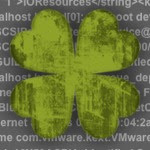 if you install the beta 10.9 driver for the "AWUS036NHR" from ALFA. For other versions of Mac OS X, just use the default Realtek driver. 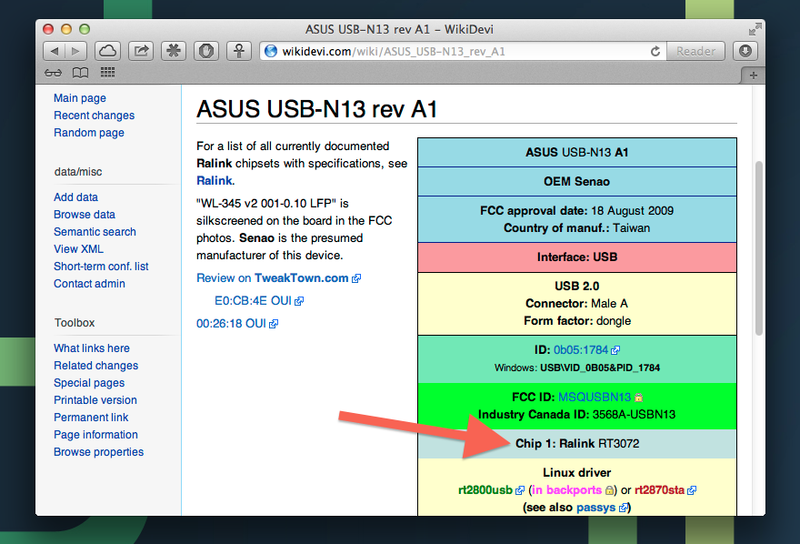 Go to Drivers & Tools -> MAC OS -> Utilities, and download the ASUS USB-N13 Utility. 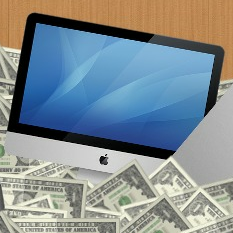 It's only designed for 10.7 Lion and older, but it also works in 10.8 Mountain Lion and 10.9 Mavericks (!). The default Realtek drivers for 10.7 Lion and 10.8 Mountain Lion may also enable this adapter to work on 10.9 Mavericks and 10.10 Yosemite(!). Also works in 10.9 Mavericks (!). Image credits from Double-J Design.